Why artificial intelligence will change our views, and why you need to know that. The technology industry is comfortable with trends that increase linearly for decades—and many that follow quadratic curves, also seemingly forever. Moore’s Law and the rate of adoption of new technologies are two examples that come to mind. Those same trends can be used to scare or even create panic amongst a less informed general public. Such is the case with Artificial Intelligence (AI), which has driven industry pundits to project when machines will become smarter than humans (the Singularity), and when none of us will have jobs anymore. Will we all have a basic wage and be free to use our time in whatever way we want? How will society adapt to large percentages of unemployed persons? While I don’t think we will see anything like the Singularity in my lifetime, it is clear that technology keeps causing social change, and that can put significant pressure on individuals, policy makers, and economies. Each technology advancement does create social change. We are aware of some of these, but others remain hidden until they become exposed in news headlines. A recent case in point is the breach of data from Facebook. This suddenly has made people aware of how much is known about them, their lives, their wants and desires, and this information is being sold and used to target the selling of goods and services to them. Society has awoken to the realization that nothing about them is private. Utilizing applications that tout zero cost often means dealing with the devil. While such headlines can cause progress to go in zigs and zags, the fact is clear that computers and robots will continue to change our lives. The balance is tipping in favor of computers/robots for many tasks. How will society change and deal with the dilemmas and paradoxes that it will create? 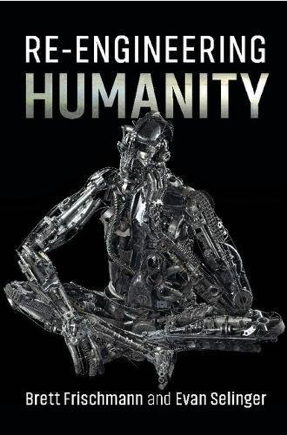 That is the subject of a new book that has just been released by Brett Frischmann and Evan Selinger, entitled Re-Engineering Humanity. The two authors combine knowledge about law, business and technology to tackle difficult questions about the human/computer relationship as it changes. The book identifies some of the things that we need to be doing as technology creators. We are a relatively small group of people, and yet we hold the advancement of humanity in our hands. That is a big responsibility that none of us should take lightly. Have you thought about the implications of what you are doing and asked if it benefits humanity? Or is it purely about making money? Technology always has moved faster than laws, but it should not move faster than our ability to reason about ethics, to consider ways of maintaining dignity for those displaced, and to ensure that we are not willfully or even inadvertently advancing discrimination. I have seen many cases recently where large corporations are doing things that introduce bias and discrimination. An example is the mandatory usage of a cell phone for dual-factor authentication. What does that do to people who cannot afford a cell phone, or those who live in rural areas without cell phone coverage? If any of you take this subject seriously, this book may well help you to develop some of your own critical thinking about the subject. Will you agree with everything in the book? I very much doubt it. I started disagreeing with things by about page three, but it did expose to me to many aspects that I was not aware of, had not considered, or for which I had not fully understood the implications. It should help you to formulate your own views and opinions that will guide you as you create new technology. We can make this a better world, or we can just see technology as a way to make more money. And yes, I really do mean we have the power to control this. So far there are no tools and no clear methodology to eliminating bugs. That would require understanding what an AI bug actually is. And it’s going to push the limit on semiconductor design, manufacturing and packaging. OneSpin’s CEO looks at what’s needed in this computing space, which technologies are winning, and what the key metrics will be.